With a double-digit growth rate over the past two years, in terms of corporate overall as well as in the woodworking machinery market alone, SCM, the world leading producer of secondary woodworking machinery, is to participate in the 19th edition of Holz-Handwerk (Nuremberg, 21-24 March 2018), where it is to present to the international market its huge collection of hi-tech applications and services, unique in the industry, which have traditionally made SCM not just a supplier but also a partner to its customers. In "Holz-Handwerk is the right venue to showcase one of SCM's all-time main assets: solutions that are unique in this industry and that are able to meet all market needs - from those of a small-sized carpentry shops to those of large industrial companies, from solid wood to panel processing," says Luigi De Vito, SCM Wood Division and Group Sales and Marketing Director. 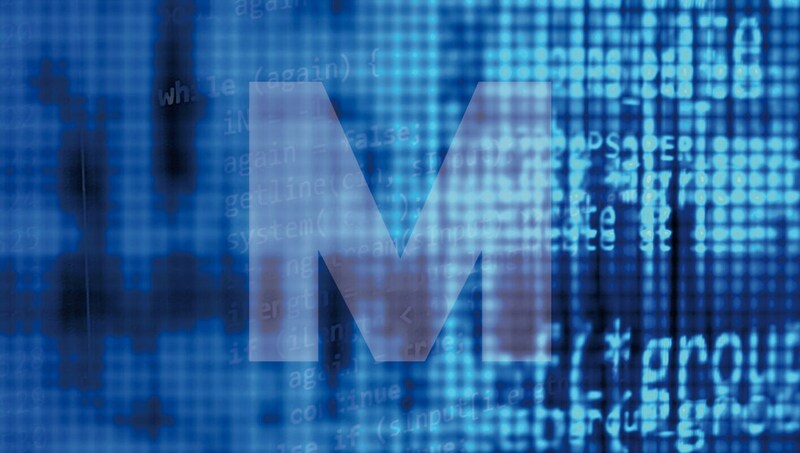 "A competitive edge that also derives from an exclusive, continuous commitment to innovation, to keep up with the major changes underway in production technologies." 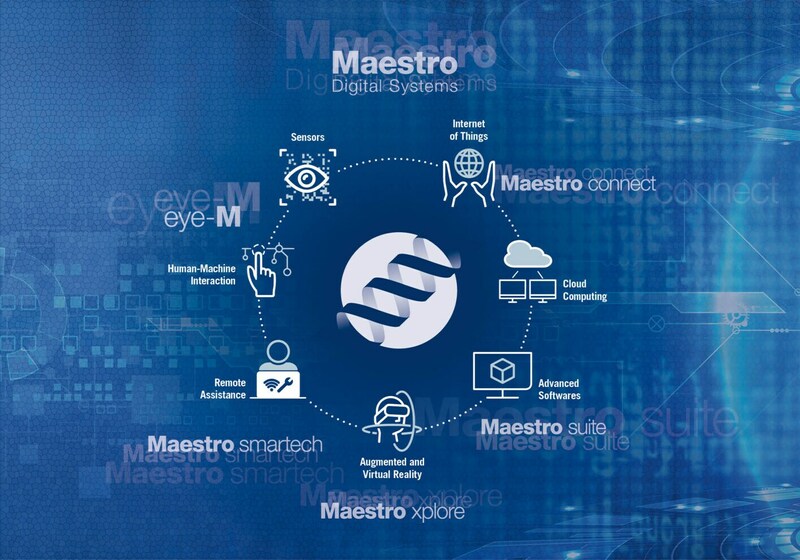 In Nuremberg, the Italian Group will launch Maestro Digital Systems, the platform of latest-generation smart digital solutions, perfectly integrated with SCM machines, to make every stage of woodworking easier and faster both for small-sized companies and for the largest multinational organisations. 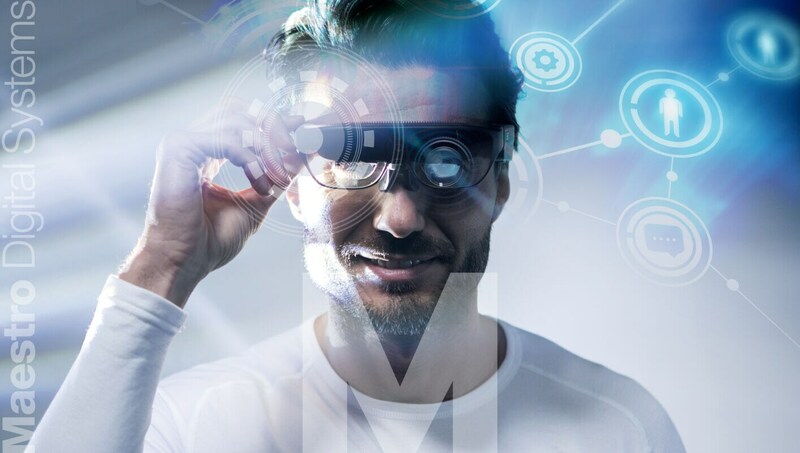 A highly digitalised, "futuristic" exhibition area will welcome SCM's visitors: over more than 1,300 square metres it will host SCM's unique Digital Hub - which has already thrilled the 2,500 industry professionals that flocked to the Open House at SCM Headquarters, earlier this year in Rimini, Italy. A real, innovative control centre designed to point the public toward new horizons in secondary woodworking. “Work simple. 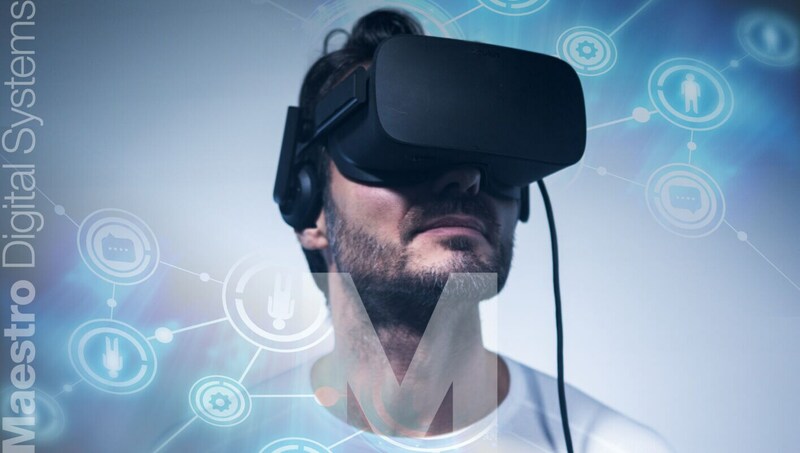 Work digital" will be the concept underlying all SCM communication at the exhibition, the leitmotif of all the technological and digital innovations introduced in order to make daily work in the woodworking industry easier - while always guaranteeing top level know-how. 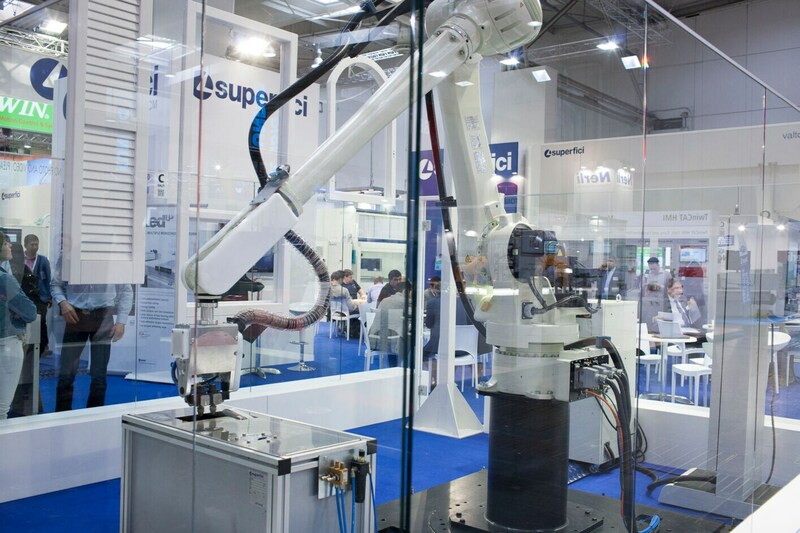 At the Nuremberg show, SCM will display its whole range of industry-specific technological innovations: panel and solid wood machining centres, a wide range of solutions for the various machining stages, from cutting to edging, from sanding to surface finishing, from pressing to specific door and window systems, all the way to the widest and most advanced machinery line for small-sized carpentry businesses. The main focus is on the software and the upgrades that allow SCM systems to meet the newest and most sophisticated market requirements. At Holz-Handwerk 2018, scheduled at the same time as the Fensterbau Frontale two-yearly event dedicated to the window and door industry, SCM will present a preview of the latest evolution of its Accord range, which is expected to raise considerable interest among door, window and stairs manufacturers. accord 42 fx is the machining centre equipped with the new operating group consisting of 2 independent routing units (3+5 axes), designed to combine in the most efficient way heavy duty profiling at high power with production creativity and flexibility, according to the demands of a market where the focus is increasingly shifting towards customized products. Also on display at Nuremberg is superset nt, a throughfeed moulder enabling unlimited applications - profiles for windows, doors, stairs and furniture. It is equipped with: SET UP system making setup operations up to 20 times faster than competitors; T-SET technology for quick tool locking and unlocking, which guarantees highly flexible production of increasingly smaller batches. The new MOBILE PC electronic control greatly simplifies the operator's work, thanks to intuitive programming, clear and accurate information based on detailed reports, and images of profiles and tools. windor nt1 is an angular machining centre with a compact footprint but able to offer all the required features for doors and windows manufacturing, with an outstanding productivity of up to 20-25 windows a day. The SCM solid wood machining line also includes balestrini pico md3, the CNC Tenoner-mortiser for joints of raised panel doors, frames, doors and windows. Also on display is the most advanced Morbidelli technology for the furniture industry, with the evolution of its all-in-one models that allow a single machining centre to meet the needs of larger- and smaller-sized companies active in different industry sectors - from furniture to boat building. One such machine is the morbidelli p200 drilling, milling and edging machining centre, standing out for its innovative edge-banding unit, which processes panels up to 80 mm thick, and for its exclusive HE-POD suction cups, making the most of the machining centre potential thanks to alternate workpiece lifting. Another attention grabber is the morbidelli m220 machine with FAST 14 system - allowing for tool changeover between machining cycles in less than 15 seconds in addition to 60% fewer drilling cycles. Finally, the five-axis spindle offers unparalleled finish while the market-exclusive spindle can house up to four tools. Also on show is morbidelli cx200, the vertical machining centre, able to handle all drilling and milling operations in less than 10 m2. Cycle times among the lowest in the market, thanks to the two drilling heads with RO.AX (Rotoaxial spindle) technology, independent spindles to optimise any drilling scheme, a powerful spindle and a tool storage with automatic changeover are the ideal solutions for manufacturers who need to manage Batch 1 orders with high productivity rates. At the show, the range is completed by the nesting machining centre morbidelli n100. With its compact footprint, it allows for complete panel processing in limited space. Equipped with an aluminium flat work top, it is available both in a stand-alone version and with an automated loading/unloading system. SCM is bringing to Holz-Handwerk edge-banding machines that are fast, error-free and meet the highest quality standards. An example is the new airfusion+ device, which helps the hot-air/zero glue line application increase productivity by +10% and cut start-up times by 50%. 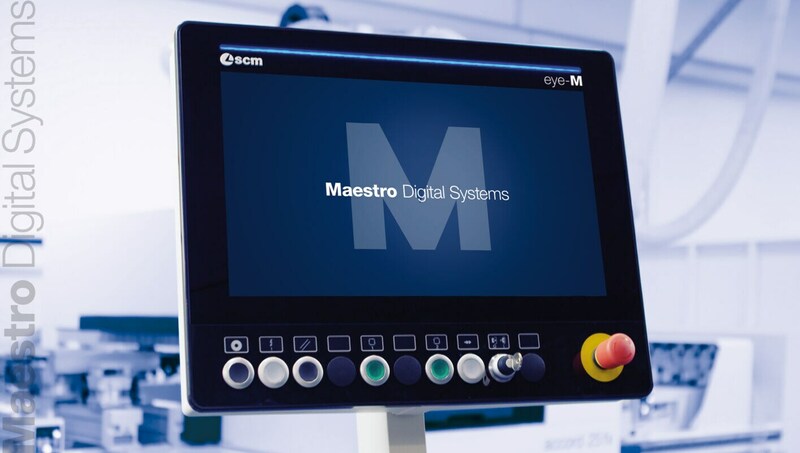 Among the machines on display, which include with the new HMI "eye-M" with 21.5" multitouch display featuring 3D preview of the machined panel, there will be stefani XD, the most up-to-date application of the wealth of expertise acquired by SCM in the field of industrial edge-banding. Among its added values are the generation E spindles, designed to provide a solid balance between lightweight machining and new rigidity standards. 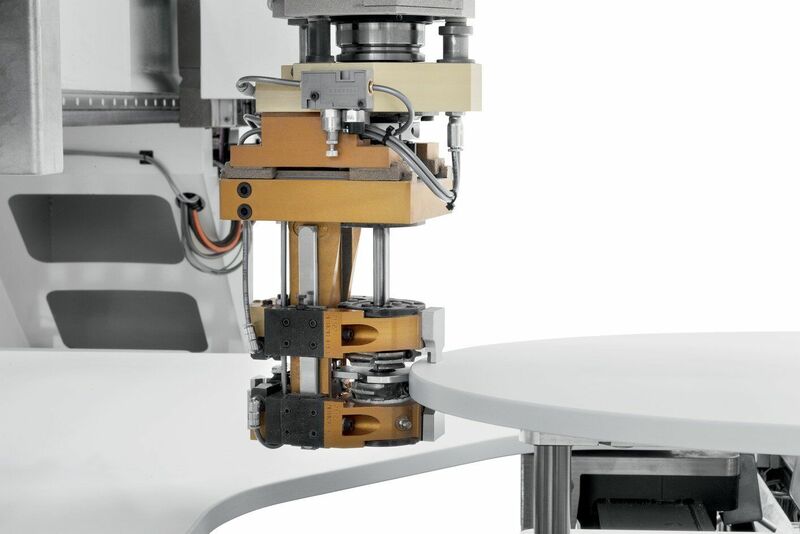 The new stefani kd edge-banding machine, an ideal half-way solution between the requirements of small-sized carpentry businesses and industry giants, is equipped with an SGP EVA and polyurethane-based glue tank, is fully electronic and therefore offers automatic setting-up of spindles, able to machine edges with 2 different radius dimensions and up to 12 mm thick solid wood. Moreover, it allows to continuously edge several panels which may also be different from each other, at high productivity rates, thanks to a machining speed of 20 m/min. Also on display is a new, fully automated version of olimpic k 360, ideally suitable for smaller-sized companies. In this edge-banding machine, too, the use of "multi-edge" electronic axis spindles allows for a simple and error-free automatic set-up for machining edges with two different radius dimensions, various low-thickness items and solid wood. Top-of-class machines, high performance and continuous innovation have always been the unique qualities that have made SCM the world leading producer of woodworking machines. This is confirmed by the vast choice of different solutions exhibited at the fair, starting from an all-time favourite, "L'invincibile", setting a standard of excellence for the industry in the small carpentry business sectors, showcased with evolved designs and technological specifications. Thanks to years of experience, technological research and Italian genius, SCM's "L'invincibile" is the acknowledged market leader and industry benchmark in terms of precision, reliability and safety. 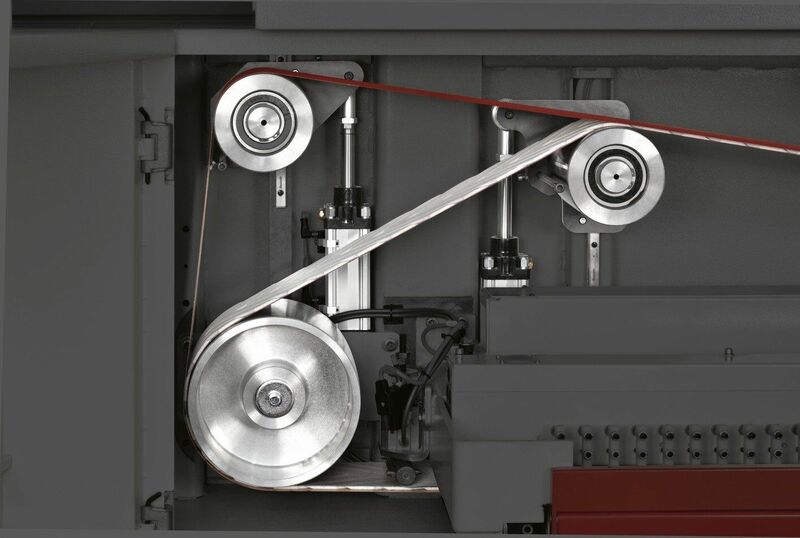 The dual tilt introduced in the circular saws si x of the Invincibile range is now extended to the smaller "minimax" version with the introduction of the minimax si x model with +/-46° tilting blade and programmable motor-driven movement: SCM's cutting-edge technology sets new industry standards. The new vf extractors are innovative clean air filters that complete the widest range of woodworking machinery on the market. Low-noise and efficient, they are ideal for any work environment. The new SCM plan to further strengthen SCM's presence in the pressing sector will be launched in Nuremberg with an even wider range of solutions, able to respond to requirements of all market sectors. 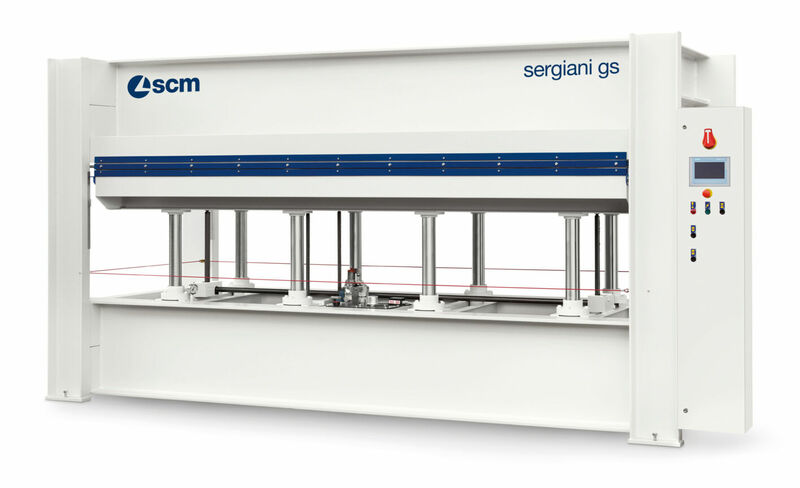 Thanks to a partnership with one of the largest Italian manufacturers in this industry, the range of manual sergiani gs and automatic sergiani gsa presses has become even more competitive. Available in versions from one to five compartments with 20 to 200 tons vertical thrust, this electronically controlled line of presses stands out for its high precision and application flexibility in the fields of veneered panels, hollow-core doors and multi-layer panels. unit for differential cutting allowing up to 30% greater productivity with limited footprint thanks to simultaneous longitudinal and transversal cutting options. The focus is also on the dual motorised carriage enabling dramatic cycle time reduction and improved brushless motor clamp, and the webcam installed on board the machine (an additional Maestro Cut application) allows the operator to monitor directly from the console (even remotely from the office) anything that happens with the machine. 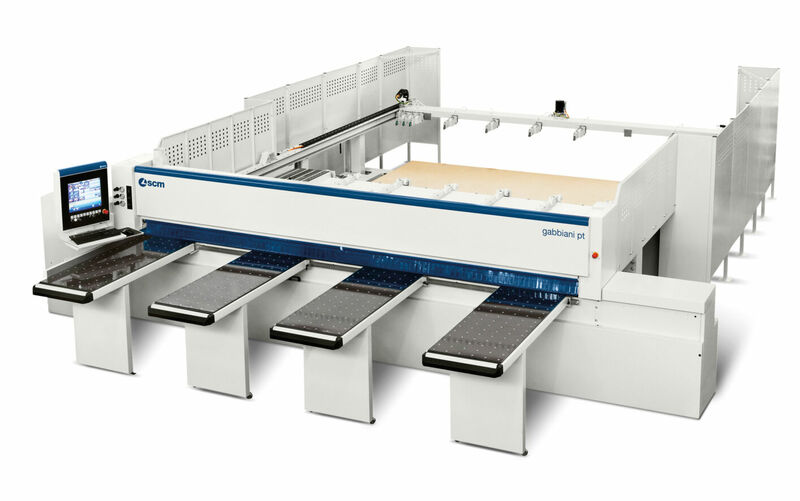 gabbiani G2, the only cutting machine to feature a highly competitive price, as well as the same performance levels as top range machines, will also be displayed at Nuremberg. 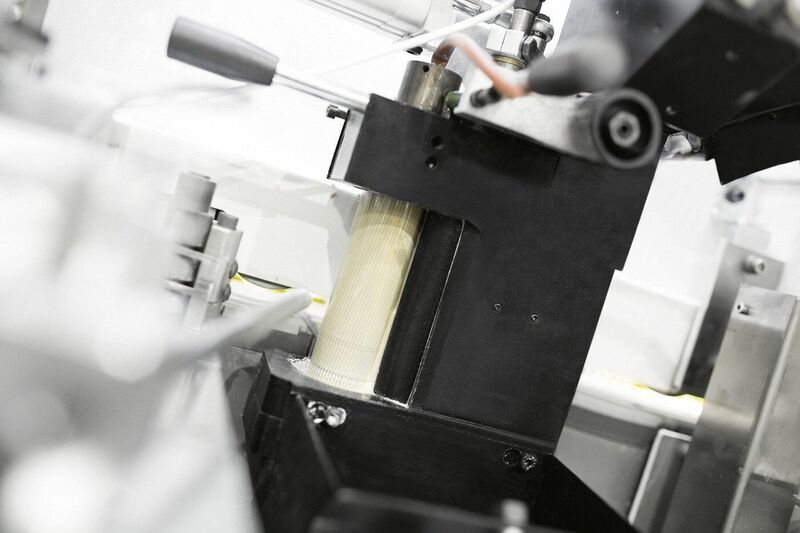 It ensures quality cutting of even very delicate materials (rock wool, polystyrene, etc.) thanks to a controlled axis press. Other interesting features are the new HI-TRONIC saw blade carriage, allowing high speeds to be reached for top level productivity, and the new optional Saw-Set, considerably reducing and simplifying set-up and management times while increasing operator safety. Among the numerous models designed for industrial-scale production, SCM presents different configurations to meet any requirement and to achieve striking finishing effects. On show at the Nuremberg fair is the compact, versatile and modular dmc eurosystem sanding machine, suitable for up to four internal units and the ideal solution for door, window, and kitchen cabinet door manufacturers and for the panel processing industry in general. New in this model is the internal cross belt unit (the latest addition to numerous other units existing in machine range), particularly suitable for solid wood range and primer layers sanding. Thanks to this unit, dmc eurosystem can be used as a one-stop machine to achieve new goals in finishing standards, both for calibrating and sanding solid wood and for painted workpieces. Also on display is the dmc system t5 sanding machine equipped with a PLANETARIO unit and FINESAND orbital pad, ideal for sanding doors, windows, kitchen cabinet doors and crossed-grained wooden panels. Completing the collection of sanding machines on display at the fair is dmc sd70, which combines compact dimensions with high performance. The four available versions with two or three units and a 2620 mm belt make it ideal for highquality veneer and painted wood finishing. Noteworthy is also the superfici finishing machines with their cutting-edge painting solutions for panels, furniture items and doors and windows. 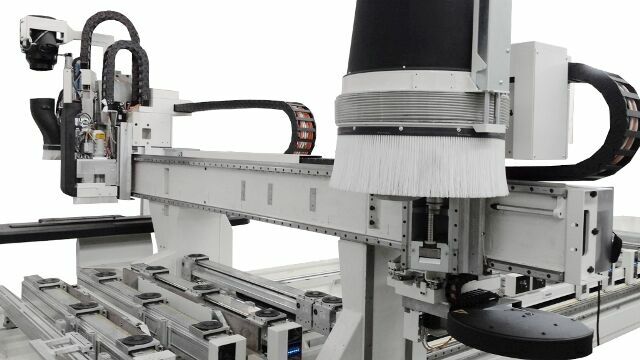 The anthropomorphic maestro robot will be on display at the Nuremberg show with its 6-axis arm, extendable to 11-axis arm, which can provide improved spraying quality, efficiency and flexibility, optimised cycle times and painting methods for each workpiece, reduces paint waste and fast and automatic colour change, even for small batches. The robot can be controlled remotely, with the possibility to program work sequences via simple and intuitive software.